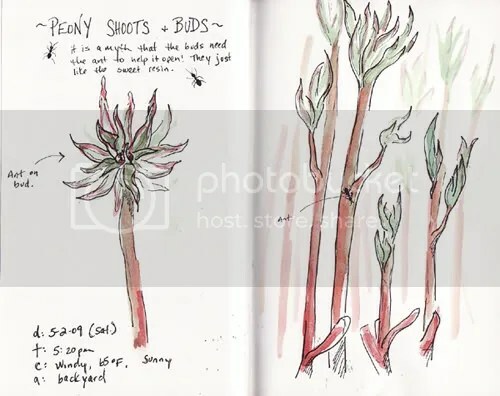 Tender Peony Shoots Sketch – Let's Paint Nature! In my backyard I have a 7 year old peony bush. I love it so much! It definitely is the highlight of the spring season. This bush produces several gigantic light pink flowers that gives off the sweetest aroma! When I smell it, I close my eyes and take the longest whiff. They say that if one of your senses are blocked (eye sight) your other senses are sharpened. I think it helps me remember that unforgettable spring perfume. Too bad the flowers only last about a week…all that waiting for only one week! Well, let’s enjoy every last second of this beautiful peony bush by sketching it’s progress. The funny thing about the peony bush is that when it starts growing, it shoots up super fast. It was only last week I cleared the ground of last year’s leaf litter and saw a few sprouts peeking out of the ground. This week the shoots are nearly 15 inches high! Holy Cow! What I love about this stage is that the shoots are thick and red. It is only the leaves that are green, but even the green leaves have a red outline on each leaf…it’s so pretty! The leaves are narrow and closed inward…protecting the bud. It’s their job at this time, it is what they were designed to do. Every thing has a plan. If looking from above today, the buds are about 1/4″ wide. Very small. The surrounding leaves are unravelling in a crazy pattern all around. It looks like a crazy mess, a crazy organized mess. By the way, it is only a myth that the ants you see on the buds are necessary for the buds to open. Not true! The ants are attracted to the sweet resin that the buds emit. They do absolutely no harm to the plant or flower so no pesticide is needed. If you want to bring cut flowers in the house without the ants, cut them the night before, wrap the ends in a wet paper towel and lay on the grass. By morning, the ants will have left and you can bring them inside. I did this last year and one ant managed to hide inside all night long. Oh well, I can handle one…not ten! ← Let’s Paint a White Throated Sparrow! Lana: Do you remember their wonderful smell? I bet you do. I’ll have to dedicate a peony painting to you! Pingback: Let’s Paint a Peony Flower! « Let’s Paint Nature!